Edwin and Nancy Cole took the truths and experience gathered from over half a century of marriage and ministry together to write Unique Woman. In one of Christianity's modern classics, the Coles furnish tools to achieve the image God holds for women. 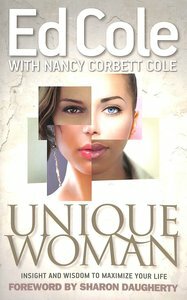 In the same upfront and honest style that made Ed Cole an internationally known minister to men, he learned with his wife Nancy, whom he called "The Loveliest Lady in the Land," to answer the heart's cry of women around the world who said, "Write us a book!"